Whenever we are investing our hard earned money into something, we always wish to get the best out of the same. Choosing any service provider is not easy. If you wish to hire packers and movers for shifting the things, you need to research well about the movers. We are thankful to the moving companies that come in our rescue to manage the requirement of move properly. Packers and movers are the professionals who take our burden of relocation and provide us with the safest relocation. As they are there to manage the requirement of shifting, this is the only reason why we can shift to a long distance with the loads of goods that we possess. But, not everything which glitters is gold and the same goes with moving companies. Not all the moving companies that look good are good actually. There are many fraud moving companies that are surrounded by us and all we need is to identify them. The worst thing is that, even the fraud companies seem as a good one initially. The more you search the more you will find about the companies. 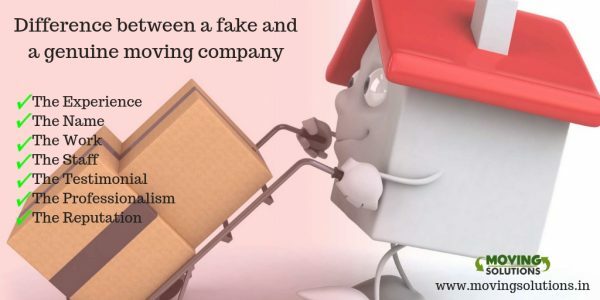 There is only a thin line between a genuine and a fraud moving company and you need to identify that. This is an article where we are going to tell you about the thin line. In the world full of fake packers and movers, if you wish to identify the right one then below we are mentioning the ways that can get you success. The tips and points mentioned below will surely aid you in spotting the difference between a fake and a genuine moving company. The Experience: There are many ways to find out whether the company is good or not. The first and foremost scale for you to measure the authenticity of a moving company is based on the experience. If you are finding that the company has good years of experience then you can consider it for handling your goods. On the other hand, trusting a novice with your goods is never a good decision. It is just like handling things by own. When you are already investing on a moving company, ensure they have experience. The Name: They say what’s in a name, but there is much more in a name. If you come across a brand and are looking forward to hire the same for shifting then it might be a great decision. On the other hand, trusting on a name that is not so popular can be a great risk. A company which is already good would earn name and fame in the industry but the one which is not good would not be known by many. The Work: You can also evaluate about the moving company through their work. Ask them about their past work and also about the reference if they can give. A company which would be genuine would provide you reference unhesitant. But, on the other hand the fraud moving company won’t entertain this requirement of yours. They would hesitate in providing the reference of about their past work. The Staff: The staffs of moving company are the true reflection of the brand. When you are dealing with a reputed and genuine moving company, you will find that every the staff is well trained and is qualified to handle the work provided. On the other hand, if it is a fraud moving company then you cannot find any of the signs like this in the staff. So, if the staffs are good, the brand is good. The Testimonial: Learn what the past customers have to say about their work. This will help you out a lot in making the decision. A good testimonial of moving company means they can be hired for the upcoming challenge of shifting. If you find that people don’t have good opinion about moving company then it is actually an alarming sign for you. Don’t hire the one that is marked negative by many. Check the testimonials on different platforms. This will aid you to make the right decision. The Professionalism: If there is professional assistance then the complexity of move will become easy. If you find a great professionalism in their work, like the way they are dealing with you from the beginning till the end. Then definitely it is a great choice to make. On the other hand, if you find that the company never turns out in his promise and is not punctual for the things, then it would be better to leave that option. The Reputation: A good thing is good for all and so as the packers and movers. If you find that the moving company which you have decided for the move has a good reputation in the market then you can hire them for shifting the things. On the other hand, if you find that there is something wrong with the company’s reputation then it is better for you to leave that option and search for other good name. There are many fraud moving companies and this is a reason why you need to be active for everything always. When you come across the name of a moving company, you are supposed to do best of the research from your side. Until and unless you check the company on all aspects, you cannot hire the same for shifting your things. From the license and registration of the company to the reputation and testimonial, everything is important and needs to be checked and verified. The points that we have mentioned here would definitely help you to find a company which is actually a good choice for you to make. You should check the testimonial of the moving company, if you have shortlisted the same. The professionalism and market reputation of company is also something that works. Checking the company on all the aspects mentioned above will make sure that you are hiring the one that will take your shifting requirements at a positive note.